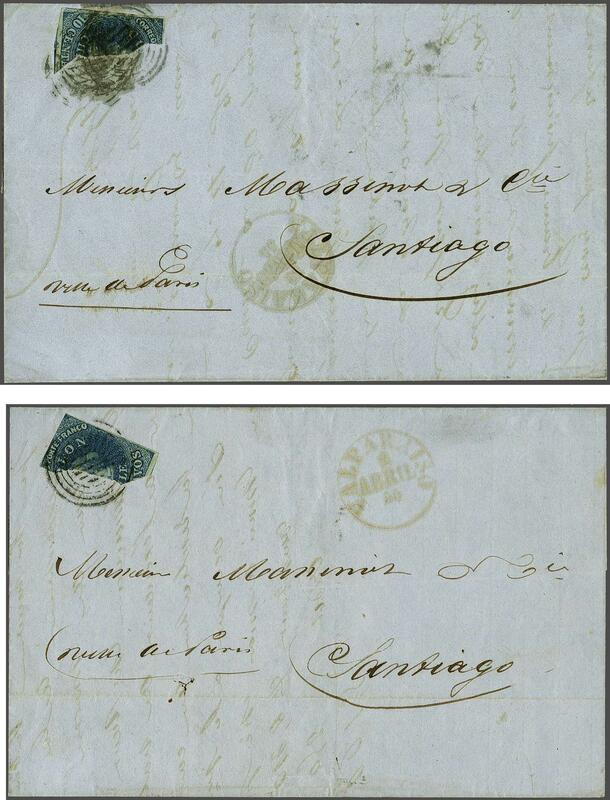 Recess by Narciso Desmadryl from Perkins Bacon Plates 1854 (Sept): 10 c. deep blue, a matched pair of roughly separated vertically bisected usages on entire letters (2) to the same addressee in Santiago, with March 31, 1855 entire letter with left half of 10 c. tied by target handstamp with watery VALPARAISO datestamp in red; second entire letter bearing the right half of the same stamp neatly tied by target handstamp with VALPARAISO datestamp adjacent (April 2, 1855). Illustrated in Edition D'Or XXVI on page 86. A rare and charming pair, the ultimate 'matched pair'. Cert. Corinphila (1996).rnProvenance: Collection A. L. Pemberton; Collection 'Islander', Corinphila sale 95, Dec 1996, lot 877.